Protect Data. Simplify Management. Reduce Costs. With the explosion in email volume and increasingly strict regulations for e-discovery requests, email archiving is a critical security requirement for organisations of all sizes. 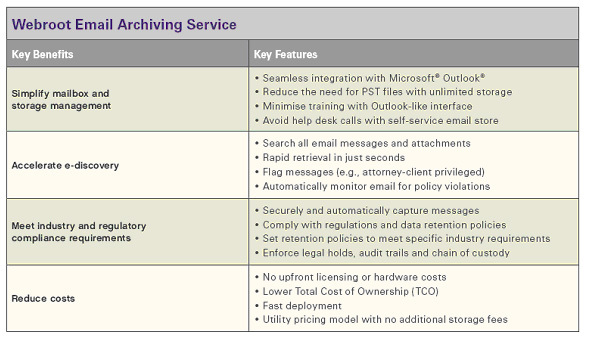 Webroot Email Archiving Service is a complete and affordable software-as-a-service (SaaS) solution designed to seamlessly meet and exceed your email archiving needs. This fully managed, web-based service provides the advanced benefits of e-discovery and mailbox management solutions�without the significant financial costs and internal IT resources of an on-premise system. Email messages are captured by your email server once they are sent and received. 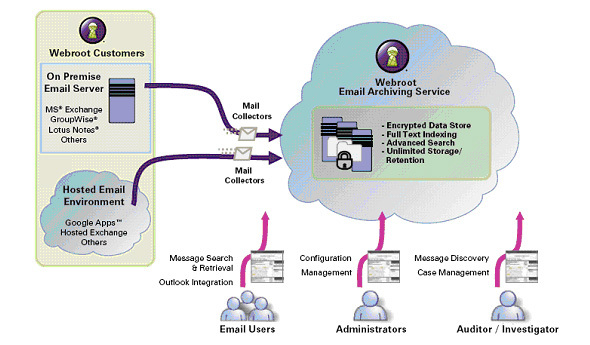 Messages are journaled and securely transmitted to the Webroot Email Archiving Service using either TLS or SSL encryption, depending on customer requirements. Emails are captured real time by Webroot and immediately encrypted and replicated across geographically dispersed data centres. Users are able to access the archive and locate specific messages directly from Microsoft Outlook. Administrators and delegated authorities are provided with advanced search capabilities providing fast email retrieval and expedited e-discovery.